Wake up and fuel your body with the perfect high-protein meal! There's nothing better than starting your day with a hearty breakfast. 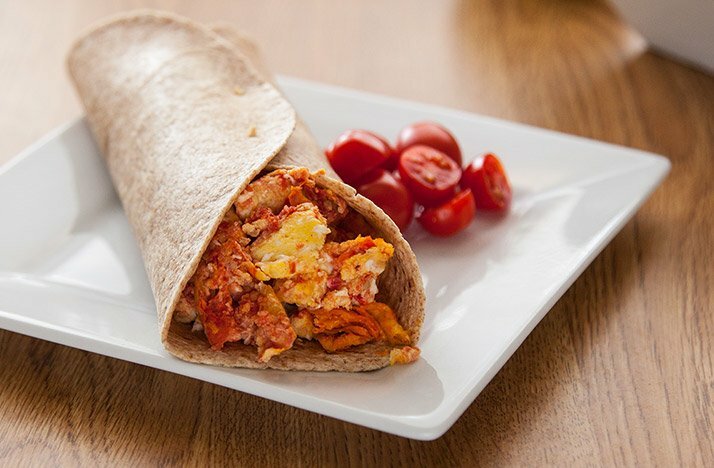 Make these wraps and you'll get exactly what you need to make your day a great one. Place all cherry tomatoes in a blender and pulse until smooth. Add tomato purée to a nonstick skillet on medium heat with olive oil. Add spices and cook until all water is evaporated (around 8 minutes). In a bowl, beat eggs. Add eggs to tomato mixture. Cook for 6-8 minutes, or until eggs have separated from the side of the pan. Place egg mixture into wraps.